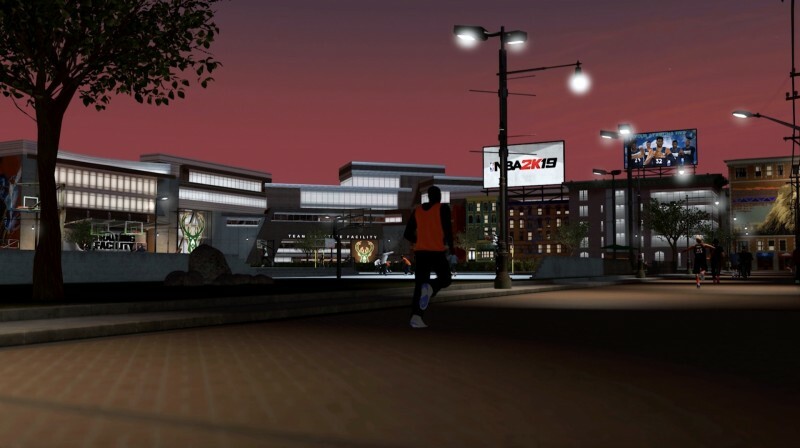 NBA 2K18 took a bold swing at innovation with the introduction of The Neighborhood, a one-stop-shop social hub that served as the virtual space where players could get a haircut, shop for new gear, or play one of the three modes supported by MyCareer. While the concept seemed promising, develops Visual Concepts has a few kinks to work out before The Neighborhood reaches its potential. 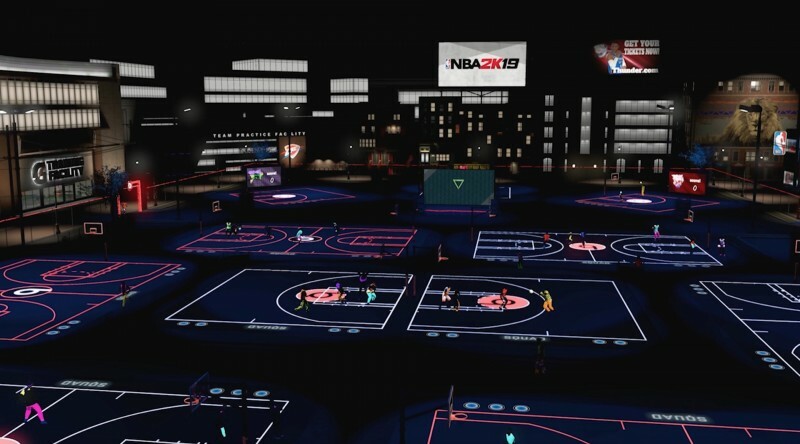 Today, we got our first glimpse of how the studio plans to innovate on the social space in NBA 2K19. Leveling an alt also gets much easier once you cross a certain threshold. "When you get to a certain level – it's 90 maybe? – then you have an opportunity to make a new career but already have a bunch of your MyPoints set, so you can skip that early progress," Bishop says. The first iteration of the Neighborhood was awkwardly laid out, making you hoof it pretty far between some buildings. The redesign makes it a lot easier to get around. "Everything is more centralized," Bishop says. "We're trying to get you from place to place more quickly. It's more user-friendly. You can change clothes right in the menu. You don't have to go all the way back to your MyCourt and then back out. Practice is another good example. If you play a game, you can go straight to practice from the post-game locker rooms. You don't have to go to the neighborhood." One of the quickplay options I have been requesting for years is a menu that drops me immediately into a park match instead of making me queue up. 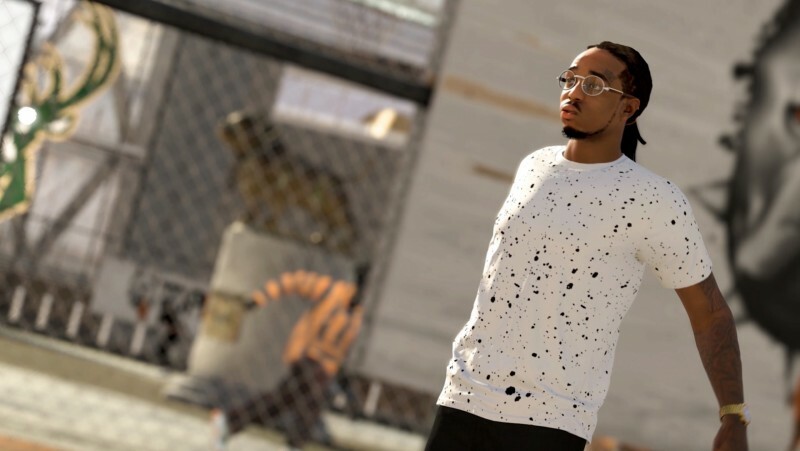 While NBA 2K19 doesn't make this quality of life improvement, Bishop thinks there should be less friction in finding matches anyway. "Got next is still there, but what I'm hoping people will see is there's such a spread of things to do you won't have to wait so much," Bishop says. "You remember you had the subway last year that would jump you to the courts? Now you can go into the subway and drop you into a new instance of the neighborhood. If you see one that's super full, you can quickly get to another one that's not so full. 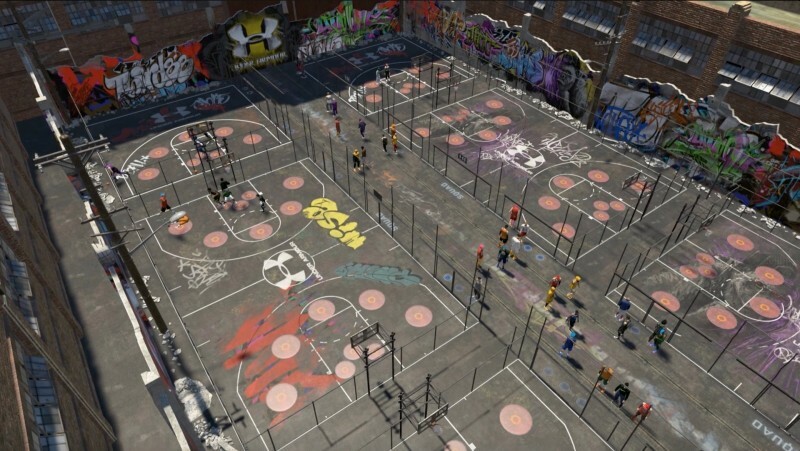 The Jordan Rec Center is essentially the replacement to ProAm walk-on. There are the cages. There's just so many more ways to play I'm hoping there's not as much of a need to wait for stuff." 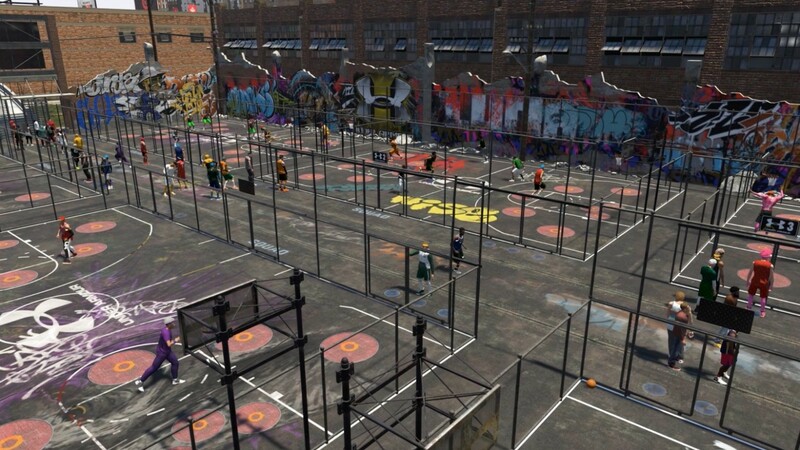 One small change I'm thankful for is players other players are no longer visible until they start moving, which means hopefully we'll see a lot fewer hoards of motionless MyPlayer zombies standing around. Visual Concepts has also created more variety for spawn points. 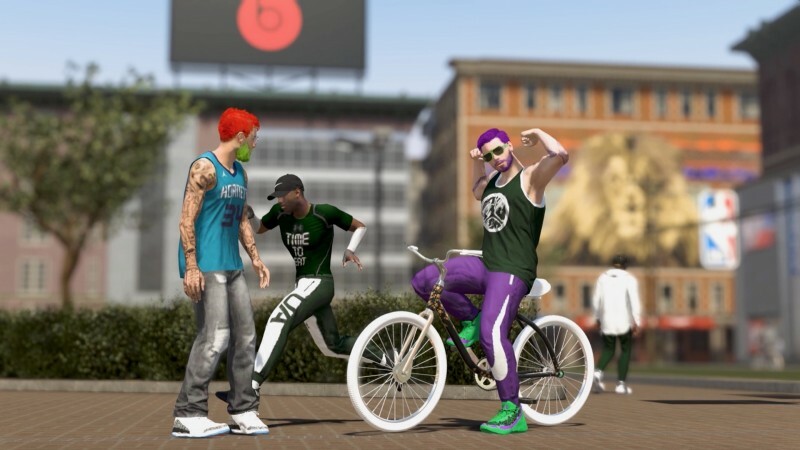 NBA 2K19 gives you a lot more gear than previous years, but the best change is that haircuts no longer cost VC. You can even preview new styles (and adjust hair length of the various looks) before you tell the barber to get clipping. On the fashion front, Visual Concepts plans to have regular drops like Throwback Thursday and Wacky Hat Wednesday to keep the threads fresh throughout the year. The Neighborhood also has two new stores. 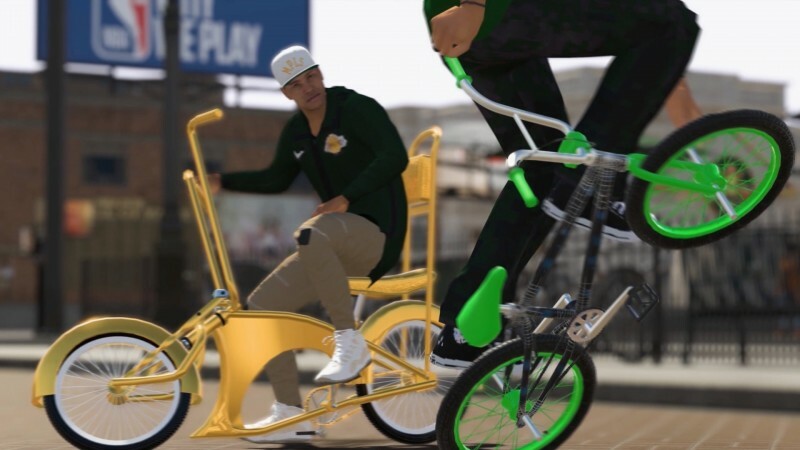 The first is Wheels, which lets you buy skateboards, scooters, and various bike styles as you rank up. All move at different paces this year (and each is faster than walking on foot). The second is a MyTeam store that lets you create a card for your MyPlayer that can be used in the new Unlimited mode. This card is capped reasonably, so don't expect this to be an easy path to a Pink Diamond. 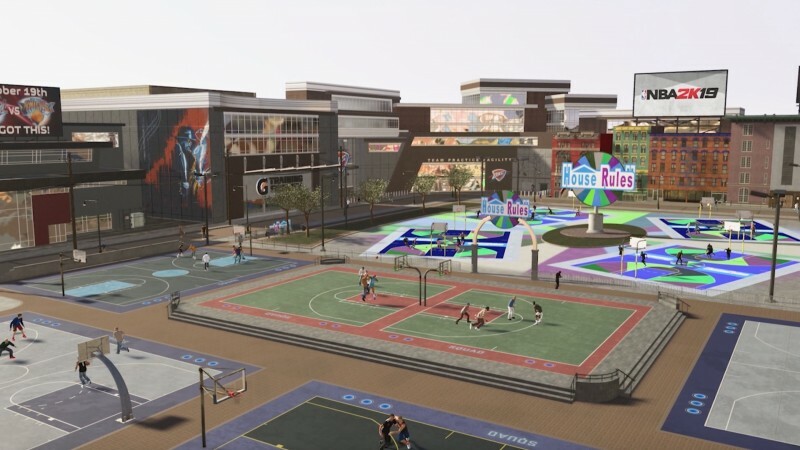 You can play Unlimited games right from the store, but you'll have to exit The Neighborhood and visit the MyTeam hub if you want to go into any other part of the mode. When you're not playing park games, suiting up for your pro team, practicing, or playing Pro-Am, NBA 2K19 gives you a wealth of new activities to kill time with, including dodgeball. This opt-in experience rewards the winner with a healthy dose of VC, as does winning the daily trivia contest. The one million VC pot is split evenly between any players who answer all 10 questions, which span in topics from hoops and pop culture to history. Then, there are the new Under Armor cages. "It's basically trampoline ball," Bishop says. "It's definitely less simulation and more of an arcadey style of basketball, but there are four trampolines on each side of the court, and you basically use them to jump off to block on defense, get rebounds, or try to do a lot of crazy dunks. It's an avenue for more highlight plays. You can play off the walls of the cage, so that's a different element." You may have noticed a wealth of different themed court designs in the trailer. Each of these is a timed live event, which Visual Concepts plans to refresh on a regular basis. "Right now, there's like 25 or 30," Bishop says. "Those will be thrown out one or two each day, and we'll kind of change it up over the course of the year. Do you remember Ruffles Four Pointer from last year? We're doing different ones like that. There's Court Conqueror, which is one of my personal favorites. It turns that whole half of the park into a medieval castle. It's surrounded by walls, but what's cool is when you are in there, you are teaming up with other people to play against A.I. players from the different NBA teams. They'll be six different courts for six different teams. They'll be like three Lakers on one court, three Sixers on another. Your goal is to try and beat all six of those teams to get big prizes. 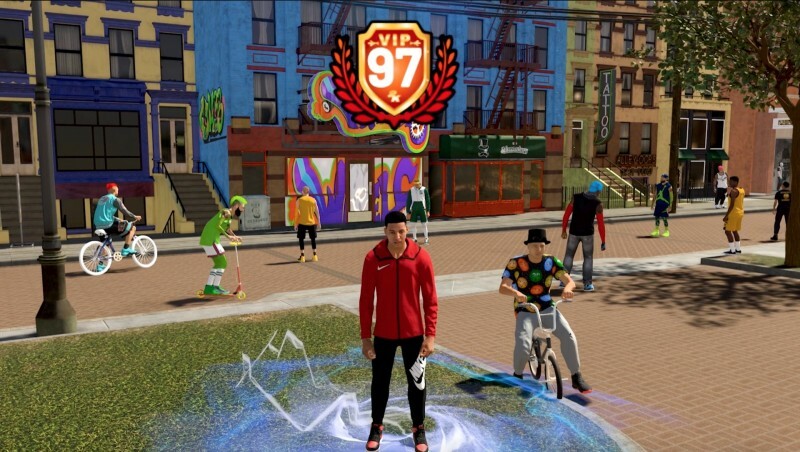 All these events are different ways to earn not just VC, but points toward breaking your cap and leveling your character up, and a bunch of exclusive clothing. We're really trying to find ways to give back." 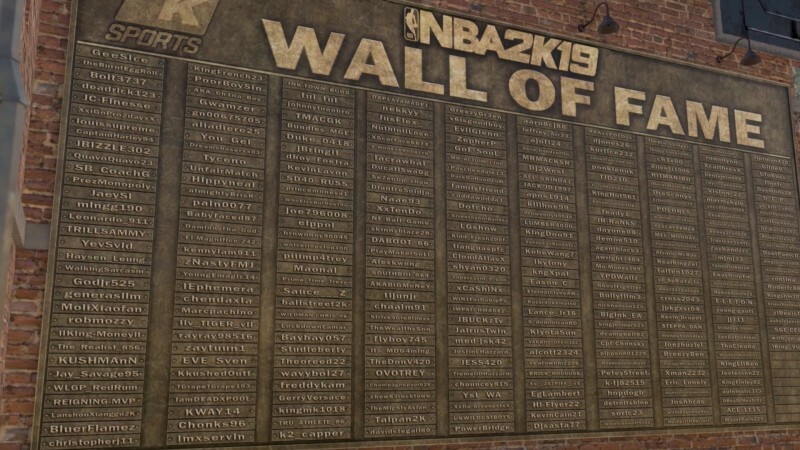 As you may have already read, NBA 2K19 acknowledges that not everyone wants to sit through a narrative to get their MyCareer off the ground. This year you can skip cutscenes to your heart's content, but Bishop says it's worth sticking around this year. "I think the narrative is the best we've ever done – it's probably the best written and best acted," he says. "Compared to last year, where it was just a scattered group of characters that didn't really have a thread tying it together very well, I think this year is much more contained in the beginning." Once you play through the Chinese League and G-League, you earn a spot on an NBA roster. From here, you'll follow the similar trajectory of gathering fans, earning endorsements, and meeting NBA stars. Last year's scatterbrained approach to MyCareer left players to their own devices. This year, Visual Concepts wants players to have a better picture of what they can do next to best advance their careers. "One of the things we wanted to do is make it clearer what you're supposed to do next and where you're supposed to go," Bishop says. "There's that endorsement screen that shows you how many more fans you need to get the next thing. 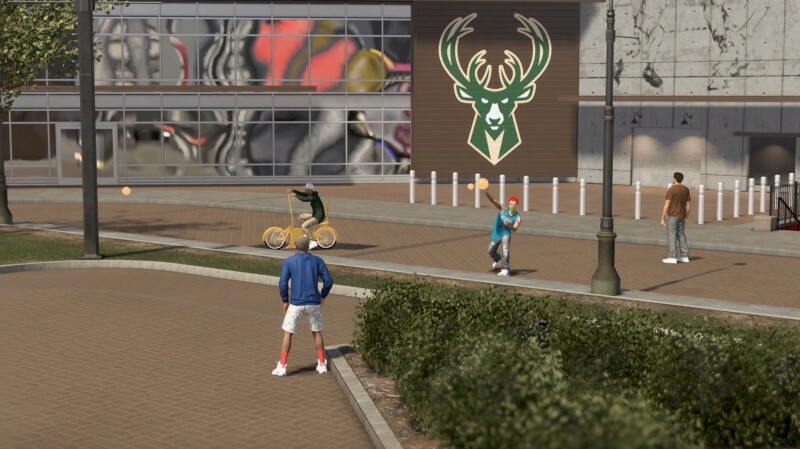 We have a new objective list so as you're playing through MyCareer you'll see what your next objective is. In the beginning, it's just going to be earning more minutes, working toward the starting lineup. But eventually, it will be trying to get into the All-Star game, getting your team into the playoffs, trying to clinch the number one seed, trying to win the championship. One of my favorite little features is you can become All-Star captain and we have a whole sequence where you can pick the teams. If you're good enough, that ends up being one of your objectives." You can still create your own court, but outside of a few new designs, Visual Concepts left this part of The Neighborhood largely untouched. No, you cannot add the trampolines from the Under Armor cages to the court. You also can't customize the rest of your crib. But at least B-Fresh isn't hanging around eating all your food and inviting strangers over. We got the message with her," Bishop says. "It really didn't work last year." The NBA 2K19 20th Anniversary edition releases for PlayStation 4, Xbox One, Switch, and PC on September 7, with the regular edition coming September 11 on the same platforms.